Today record numbers of men proudly walked a mile in women’s shoes to show their support for White Ribbon, the campaign to eradicate violence against women, domestic abuse and sexual violence. Now in its fifth year ‘Walk a Mile in Her Shoes’ attracted more than 100 participants. Starting at Cardiff Castle the walk followed a one mile route around the city centre, finishing back at the Castle. Members of the public and male employees from organisations such as South Wales Police, Cardiff and Vale University Health Board, Office of National Statistics and Wales and West Housing took part. The partnership project between Cadwyn Housing Association, Cardiff Council and the Vale of Glamorgan Council has grown from just 14 men in 2014 and for the first time this year, young people from Llanishen High School, St Teilo’s High School and Cardiff Youth Service participated in the event. Cabinet Member for Social Care, Health and Wellbeing, Cllr Susan Elsmore said: “Walk a Mile in Her Shoes’ is one of Cardiff’s key events to promote the city’s commitment to the White Ribbon Campaign and demonstrates excellent partnership working to raise awareness of violence against women, challenge attitudes and engage men in discussing these issues. Cabinet Member for Strategic Planning and Transport and Cardiff Council’s Domestic Abuse Champion, Cllr Caro Wild participated in the walk. 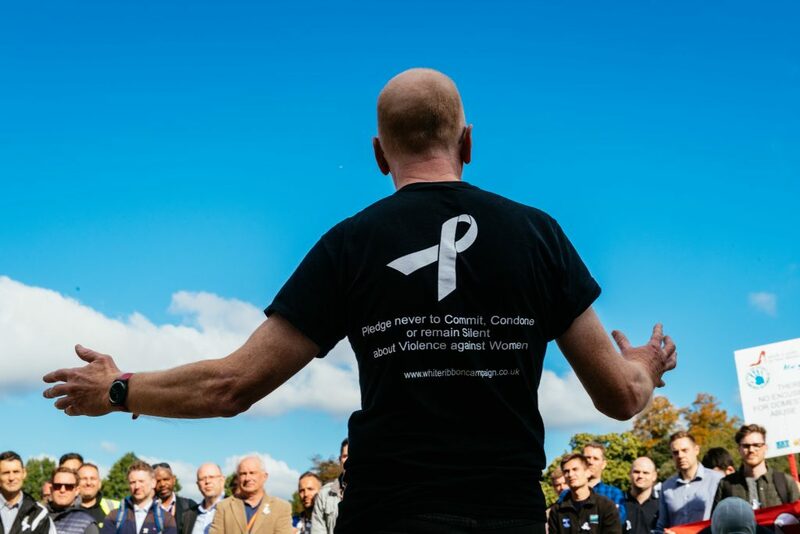 He added: “Cardiff is a White Ribbon City and today’s event shows the importance of this global movement of men and boys working to end violence against women and girls, promoting gender equality and a new version of masculinity. Chris O’Meara, Chief Executive of Cadwyn Housing Association said: “Tackling domestic abuse has always been a priority at Cadwyn and in 2014 we became the first housing association in Wales to put all our staff through domestic abuse training. It was also the year that we held the first Walk a Mile in Her Shoes with 14 men from Cadwyn donning a pair of women’s shoes and walking a mile down Newport Road to raise awareness of the White Ribbon Campaign. The event has grown each year and I’m so proud of the support it has received from the people and organisations of Cardiff and the Vale. Vale of Glamorgan Council Cabinet Member for Social Care, Health and Leisure, Cllr Gordon Kemp said: “‘The Vale Council is proud to be a partner for the annual ‘Walk a Mile in Her Shoes’ event in Cardiff. Every year in the UK more than one million women suffer domestic abuse and more than 360,000 are sexually assaulted. Although abuse against women is disproportionately higher, anyone can be affected by violence and abuse.